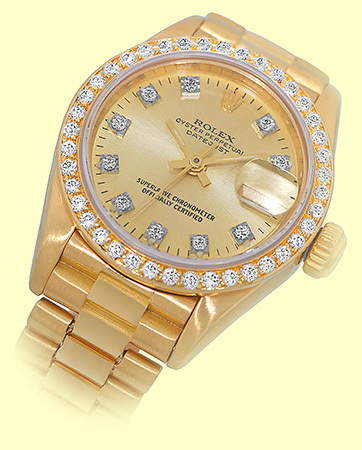 Certified Pre-Owned Lady's 18K Yellow Gold Rolex Diamond "President". Custom Geneva Collection® Champagne Dial set with Diamond Hour Markers, Yellow Gold Hands, Center Sweep Seconds Hand. 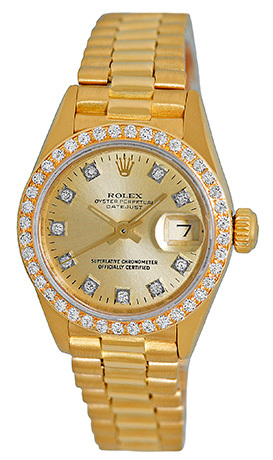 Custom Geneva Collection® 18K Yellow Gold Bezel set with Round Diamonds, Date Indicator, Quickset Movement, Sapphire Crystal. 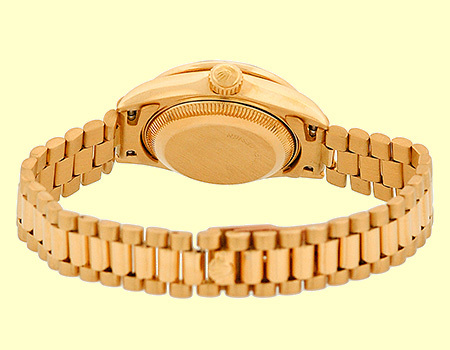 Matching 18K Yellow Gold Rolex "President" Hidden Folding Clasp Bracelet. Handmade Swiss Chronometer Certified (COSC) Automatic Movement. Certified Pre-Owned, Excellent Condition with Rolex Box, Booklets, Hang Tag and complete with Capetown's Lifetime Warranty!! Custom Geneva Collection® Champagne Diamond Dial. Custom Geneva Collection® 18K Yellow Gold Round Diamond Bezel. Click here to separate fact from fiction regarding aftermarket accessories. Click Here to read about Capetown's quality difference! 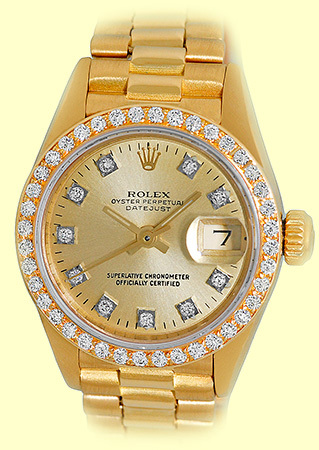 Clic k here for the exclusive benefits of buying your new or pre-owned Rolex at Capetown. 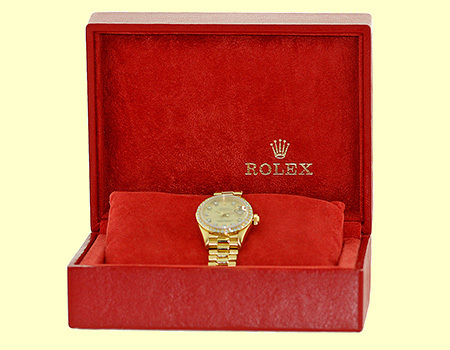 Capetown stands behind all products that we sell, including our collection of fully authentic Rolex watches - new and pre-owned -that we have enhanced with our Geneva Collection line of jeweled accessory. This fact is evident by the issuance of our Exclusive Ltd. L ifetime Warranty . C lick here to peruse the terms and conditions of said warranty. Click here to view the testimonials of thousands of our clients .